Paddy rice and livestock are the main activities of the villagers in the watershed beside labor work. Rice production from paddy is cultivated in wet and dry season and upland areas. Koum Ban Naxam has bigger area (27,737 ha) compare to Nalat (14,821 ha) but rice production in wet season in Nalat are greater than Naxam. 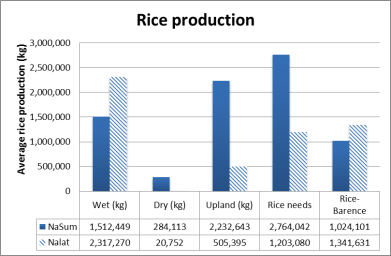 However the rice production of Naxam in dry and upland area is greater than Nalat. Actually, rice production from paddy in Naxam is sustained in dry season by irrigated schemes. 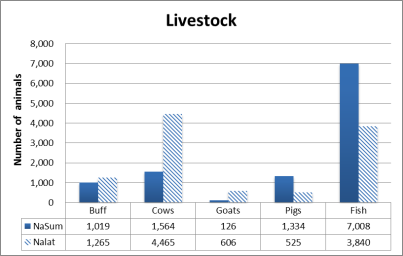 Different types of livestock have been observed in these two village clusters such as buffalo, goat, cow, pig and fish. Nalat villagers own the great number of 1,265 buffalos and 4,465 cows and 606 goats but pig farm and fish pond is widely expand in Naxam. The large area in Naxam could influence the expanding of pig farm and fish pond.